Salmon River Fishing Report Pulaski NY - SPRING Steelhead RUN! Salmon River Fishing Report from Pulaski NY. Salmon River Fishing Report for Salmon – Steelhead from this Salmon River Guide in Pulaski NY. Steelhead, King Salmon, Coho Salmon and Brown Trout. I hope you find my Salmon River fishing report, guide articles, tips and videos entertainingly informative or mildly educational. Galvanic Salmon River 20+lb. Steelhead from Pulaski NY. Salmon River Fishing Report Steelhead Highlights – Mar. April. It’s “Prime Time” Steelhead fishing on the Salmon River. The Salmon River Spring Steelhead Run is on and will last thru March. All of April is “Prime” Drop Back Steelhead fishing on the Salmon River. Add in ALL the steelhead that have been entering the Salmon River since Sept. and it’s going to be a good Spring! All of the remaining Steelhead in Lake Ontario are currently and will continue to enter and run the Salmon River in preparation for their Spring Spawn. I’ve seen a fair number of fresh Steelhead that were in a transitional state, moving up the Salmon River and holding in the transitional lies. Most steelhead are still in the Salmon River Holes with a few Spawning and Dropping Back down the River. I’d recommend coming up to steelhead fish. Things couldn’t be looking any better for your trip up here! We have fresh and older Steelhead top to bottom of the Salmon River. There really is no bad place to fish, providing you have the correct habitat – current breaks for this water flow and water temp. This directly relates to what stage the fish’s life is in. Presently, all of the steelhead in the Salmon River are feeling their biological clock ticking towards the Spring Spawn and making them behave a lil differently. (Pre-spawn, spawn and post spawn). Entering the Salmon River, finding mates and pairing up, thinking about building a red, spawning while locating themselves to different current break area’s, males fighting over the females, dropping back, etc….) Each stage is unique and puts different requirements on the Steelhead and causes the Spring Salmon River angler to adjust, in my opinion. Salmon River fishing report Steelhead Tip. – Both Transitional (running the river) holding and Winter holding spot’s are producing. As I type this, 88% of the Steelhead are in the Salmon River Holes. 8% of the Steelhead are entering and running the Salmon River, while spreading out. 2% are on the gravel and the other 2% are dropping back. These %’s will change on a weekly basis from here on out. These areas are covered more thoroughly towards the bottom of this Post in my EXPERT and ADVANCED Video’s @ Where is the BEST place to Fish on the Salmon River for Steelhead. 2nd Salmon River Fishing Report Tip. – Optional Local Steelhead waters are with fresh Spring Steelhead! These waters will be good thru the rest of Mar. into April. After 35 plus years of guiding, things never really change that much. Sharing all this Detailed info. with you has been a pleasure! FISH ON! 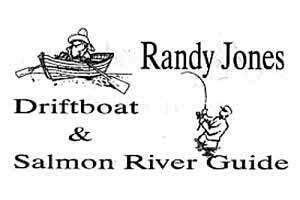 Salmon River fishing report guide, Randy Jones. For the Rest of Today’s SUPERB Salmon River Fishing Report for Steelhead. Don’t Miss this Link – March 5 Galvanic Salmon River Fishing Report BLOG. Humor. – The Salmon River Fly Fishing was SOOO good today. I had to stand behind a tree to tie the Steelhead fly on. A/P Wire – WORLD RECORD Striped Bass caught in the Salmon River NY this Winter! Tips. – April Steelhead Fishing. Where to Fish – Salmon River High Water Spring Steelhead Tip. Articles. – Lull in the Salmon River Steelhead Fishing Action with a Presence of Fish. Was I a Salmon River Steelhead Hero or a Zero? – Reading Water 101. Why are 100% of the Steelhead and Salmon Current Breaks so important to you as a Salmon River angler? What makes Current Breaks challenging to understand? Video’s. – Where is the BEST place to Fish on the Salmon River for Steelhead? 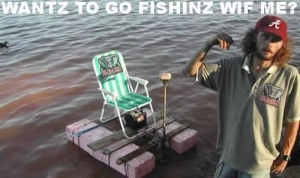 So I can Catch MORE Fish! 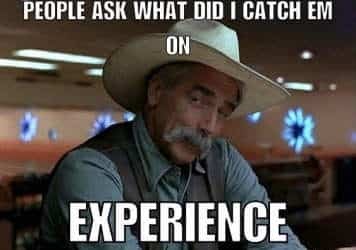 Salmon River Fishing Report HUMOR. My incredibly Detailed Salmon River fishing report w/ some ROCK SOLID TIPS! I went 20 for 30 on steelhead @ (edited for content) in the afternoon using (edited for content). This morning I fished the (edited for content) and was 15 for 20 on steelhead. Nothing on the (edited for content), all on (edited for content). Money back guarantee! har-har. FUNNY Steelhead Sight Fishing Story on the Salmon River. I’ve got my guest sight fishing to a specific spot. The angler across the river from us can’t see the steelhead. But hears me coaching, sees where I’m pointing too and watch’s where my client is fishing. Suddenly he pulls off a bunch of line and starts blind casting to the exact same Salmon River spot. I immediately told my guest to cast 20 feet further out into the Salmon River where it was 100% VOID of any Steelhead. The same angler immediately reels in 20 feet of line and begins casting to the exact same spot that was 100% VOID of any Steelhead.. To funny! My last Salmon River drift boat trip didn’t go so well. Careful who you hire! har-har. I hope you enjoyed my Salmon River fishing report Humor! Winter into Spring – Steelhead Fishing the Salmon River – Salmon River Fishing Report. March and all of April is “Prime Time” for steelhead fishing on the Salmon River. (Mid-week is always best, but not on or around a holiday). March – There are not only leftover Winter steelhead, but also fresh runs of Spring time Steelhead. March into All of April – You will see a transition of Steelhead from the holes onto the gravel, where they will spawn. They will then turn into drop-back Steelhead. The Steelhead’s appetites are on fire as they slowly drop back down the Salmon River into Lake Ontario. Amazing Spring Steelhead Video! Spring is just around the corner! A Trophy 20 lb. Spring Steelhead. What helps to cause a BIG RUN of Steelhead or Salmon? This might help plan your Salmon River fishing trip. Yup, time to schedule a fishing trip this Spring. - RESERVE MY SPOT! 100% Spring Steelhead Guarantee! – March April Calendar of Events – Salmon River Fishing Report. Fresh Steelhead Runs. 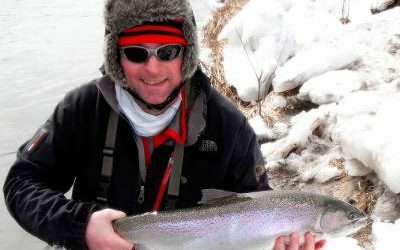 – We always have fresh runs of steelhead into the Salmon River from Lake Ontario at this time of the year. Their biological clock is ticking and telling them its that time in there life to re-produce. Causing fresh steelhead to enter, run and spread out over the entire length of the Salmon River. Early Steelhead Spawners. – This is the time of the year where we start to see our first, what I call early Salmon River spawners. Why is this important to you as a steelhead angler? Steelhead Pairing up in the Salmon River Holes. – Almost every female steelhead in the Salmon River will have 1 to 5 males in very close proximity. Often at this time of the year where you are blind casting, you will tie into 1 steelhead. There will often be a second or a third in the exact same spot, as they find a mate and pair up. So normally where there is one steelhead, there is often another one or two. So cover your water thoroughly to increase your odds. This tip comes with a $ back guarantee! My guest’s and myself have all bought that T shirt. It happens more than you would think! Did you Know? – By Catch and Releasing a female Steelhead back into the Salmon River pool, you can usually keep on catching the Males. If you keep the female, or fight her way down stream. All those males have no reason to hang around any longer and they will leave, looking for another mate. This leaves you with no more steelhead to catch. Just like reeeel life, that female is the bait and is the only reason those buck’s are hanging around. Steelhead Spreading out as the Entire Salmon River comes Alive! – What’s interesting about the Salmon River at this time of year is the Steelhead will spread out over 100% of the Spring habitat’s. From the shallows, to the edges of the pools to the pools themselves. You’ll be able to find steelhead from the Top of the Salmon River to the Bottom. From one side of the river to the other, within reason. Drop Back Steelhead – Drop backs are Spring Steelhead that have successfully spawned and are on their way back down the Salmon River to Lake Ontario. Feeding aggressively along the way. Mother nature will decide our Steelhead season ending with lower water flows and warmer water temp’s in the Salmon River. Top Secret Guide Tip – Fishing for Spring Steelhead Drop Backs. Posted for only you to read and no one else. har-har. After the Hatchery collects the eggs from the returning Steelhead in the Spring. Normally, approx. April 15 is when you will see 1,000’s of these steelhead leave the holding tanks at the Altmar Hatchery. And re-enter back into the Salmon River and turn into drop back Steelhead. Adding more Steelhead for your Spring fishing pleasure. Shhhh! I hope you found my “Salmon River fishing report Guide Tips” entertainingly informative or mildly educational. – May all Your door knobs smell of BIG Steelhead! Salmon River fishing report EXPERT and ADVANCED YouTube Video’s for Where is the BEST place to Fish on the Salmon River for Steelhead, Brown Trout, King Salmon and Coho Salmon in Pulaski NY. Money Back Guarantee! Complementary Top Secret (Ssssh!) Guide Tips on ADVANCED Fishing Locations to help YOU catch more Salmon and Steelhead on the Salmon River Pulaski NY. Please Subscribe for future Salmon and Steelhead Salmon River fishing report YouTube videos. I’m the first person to EVER Bungee Jump NAKED off the Long Bridge over the Salmon River in Pulaski NY. Police were called and I was arrested. FISH OFF! My YouTube Video Jokes for Today. I hope you Enjoyed my Salmon River fishing report YouTube Videos! Want to receive my Salmon River Fishing Report Updates by Email for Steelhead and Salmon from Pulaski NY? Subscribe to my Salmon River Fishing Report Newsletter. Includes: Current Fishing Conditions, Local News, Articles, Videos, Tips and More. Join me for a guided drift boat fishing trip on the World Renowned Salmon River in Pulaski NY for hard fighting Salmon or Steelhead during our Fall, Winter and Spring fishing seasons. Enjoy learning Advanced fishing techniques for Spin Fishing, Fly Fishing or Float Fishing and Exact Salmon River fish habitats. I always enjoy sharing my wealth of fishing knowledge with all my guest’s. If your looking to book a Salmon River drift boat fishing trip for next Fall Salmon or Nov. Steelhead, I’ve still got some prime dates open. Rates: $275 for 1 angler – $350 for 2 anglers. All Spin fishing equipment – All Orvis fly fishing equipment – All tackle provided. Please bring your own Lunch, Polarized Glass’s and Chest Waders. E-mail: [email protected] – Phone #315-963-2065 – Booking Form. Randy Jones has over 35 yrs. of Pro. 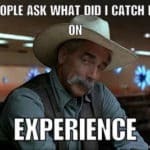 Fishing Guide Experience. 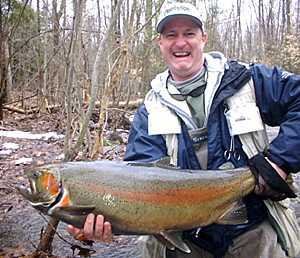 He is also the Owner, Author and Publisher of Salmon River Fishing Reports of YankeeAngler.com. 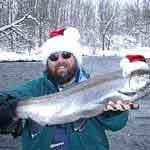 A Salmon River Pulaski NY based Guide Service and Marketing Agency. Specializing in Expert Salmon and Steelhead fishing. Professional sales and marketing of his vastly successful Salmon River fishing guide business and local fishery. S.E.O. and Social Media. Randy Jones 87 Clark Rd. Mexico, NY 13114 – Phone: 315-963-2065. Feb. 8 2019 Salmon River Fishing Report Steelhead – Highlights. Past Salmon River water flows of 1,500cfs to the present water flow of 750cfs. Has continued to bring in bright fresh Spring Steelhead that are spread out in all your favorite Salmon River fish’n holes. Older Steelhead are also Top to Bottom of the Salmon River. A continuation of the Spring Steelhead Run “Prime Time” will last well into March. The later part of March and all of April is “Prime Time” Drop Back Steelhead fishing. Add in ALL the steelhead that have been entering the Salmon River since Sept. and it’s going to be a good Spring! Today’s Salmon River fishing report Steelhead Tip’s. – Not many anglers fishing now, which is normal. Great time for you to come up and fish with lots of Prime Salmon River Winter Steelhead holding spots wide open for you. Presently, the largest concentrations of steelhead are in the Prime Winter Pools with some in Transition – running the Salmon River. Most folks are tangling with a few steelhead. Sometimes more and sometimes less, as usual. Seeing a few “early” steelhead Spawning and also a few “early” Drop Back Steelhead, which is normal. 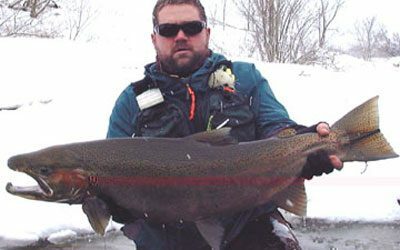 All of the Steelhead in the Salmon River and Lake Ontario have their biological clock ticking and telling them its time to enter into the next stage of their life, with the Spring Spawn just around the corner. The NYSDEC is considering 3 changes that should be of interest to you if your a Salmon River angler. * Lower the daily creel limit for Brown Trout on the Salmon River and other tributaries from 3 to 1. * Increasing the size limit for Steelhead on the Salmon River and other tributaries from 21″ to 25″. * Lowering the daily creel limit for steelhead on Lake Ontario from 3 to 2. If you care to comment on these proposed changes you can do so on the NYSDEC website linked above. 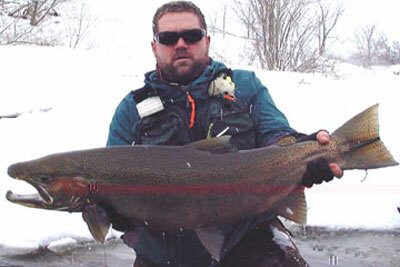 Salmon River Steelhead fishing Advantages after a Extreme cold spell. 1. 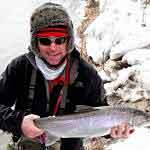 Wicked cold temps have kept many a Salmon River steelhead fishing angler away. Providing you presently with numerous un-pressured steelhead with some fresh ones around. 2. Past extreme cold temps. caused un-fishable Slush from Mid. River down. Leaving you now with unpressured, uneducated, easy to catch steelhead anywhere below Pineville to the mouth of the Salmon River. Past Salmon River Guide Drift Boat Steelhead Fishing Trip Report’s. The highlight’s for the day besides the beautiful weather and fishing company. Was both of my drift boat guest’s played with more Salmon River Steelhead in a single day then they had ever before! Congrats gentlemen! I always enjoy being a part of a record setting day and over exceeding my professional guide and guest’s expectations and goals! We were 100 % on hitting steelhead in every Salmon River spot! Another one of many “Day’s for King’s” this steelhead season! Another past Salmon River Guide drift boat Steelhead fishing report. We were 3 for 4 on Steelhead. 1 came from a deep water, tail of a hole, soft water current break. The other 3 we were using floats off a spinning rod with a lil salmon egg juice put on bead for scent, blind casting in a soft water Salmon River current break. That bead was the only one the Steelhead wanted as we had previously tried all the other normal stuff first. After we hit 2 Steelhead on that bead, I switched my other guest over to the same bead and he hit one! Seeing some drop back Steelhead off the guide drift boat. We fished 4 Salmon River spots and hit steelhead in 2. (50% on spots, cant complain). Ya-Hoo! Funny Story with 20 Steelhead in the Hole – Never limit yourself by limiting your options. I was guiding a fly fishing angler one day, with 20 steelhead in a hole. No luck, suggested a blue egg sack, he said no. After an hour of no luck, with 20 steelhead in the hole, I politely suggested an egg sack again, he finally “half heartedly” agreed. On his first cast, FISH ON! We laughed our arses off after that one! Never limit yourself by limiting your options. Ye-Haa! For the Rest of Today’s SUPERB Steelhead Guide Salmon River Fishing Report. Feb. 8 2019 Galvanic Salmon River Fishing Report BLOG – With Monster Steelhead Pic’s., Tips, Articles, YouTube Fishing Video’s and Humor. Don’t Miss – Humorous Guide Fish Tails – Why me? – The Life of a Salmon River Guide. Free Guide Tips-Article – To help you catch more Steelhead! What this Guide uses to Stay SUPER warm on the Salmon River while steelhead fishing during the Winter. John Battles Numerous Salmon River Steelhead off the guide drift boat. I’m happy to report. – Steelhead fishing remains good on the Salmon River and will continue into the Spring. We have some more fresh Steelhead. The majority of Steelhead are holding in and around the Salmon River deeper holes and larger runs. It’s Prime Time for some Winter steelhead fishing action on the Salmon River. Few steelhead anglers fishing, which opens up additional opportunities for you. Ton’s of options on where to wet a line. Today’s Salmon River fishing report Steelhead Tip. – Currently 98% of your steelhead are in all the Prime Salmon River Winter Holding pools, producing Steelhead top to bottom of the river. Tutorial Video on Prime Holding Spots – Pools. Even I….. could probably catch one….. The drift boat – wade fishing for steelhead continues to remain excellent for some, ok for others and slow for some-others. We will continue to see more fresh Steelhead enter, run, spread out and hold in the Salmon River as the season progress’s. With our past higher water flow levels we have received some more fresh Steelhead! More Welcome Snow has arrived! This will help with your Spring Water flow levels when we want colder water and above normal flows to extend your steelhead fishing season. Another Salmon River fishing report Steelhead Tip. – If there is no Slush from Mid. River down, I’d highly recommend fishing it! Due to our past “almost daily” slush from Pineville down, it made if tuff for anglers to fish these areas. Leaving you presently with a lot of uneducated steelhead. Also, due to the above, most Salmon River Steelhead anglers have been pounding the upper river. Causing the steelhead to become extremely educated and more difficult to fool. Standing on Shelf Ice while fishing Warning. Be careful! It might not support your body weight. A normal practice when standing on any Salmon River shelf ice to Steelhead fish is to MAKE SURE the depth of water below you is no deeper than thigh deep. ALSO, there are NO fast currents underneath you. Give your favorite Salmon River fishing buddy or guide a ring. The steelhead (8 to 12 lb. average) are here and just waiting for you. I hope you enjoyed today’s Salmon River Fishing report! Jan. 3 2019 Salmon River Fishing Report Steelhead – Highlights. I’m happy to report. – A nice BIG RUN of fresh dime bright silver missile Steelhead entered and ran the Salmon River during our last high water period ending on Dec. 8. Most experienced Steelhead bank anglers did very well, including my Salmon River drift boat clients. I was seeing 50% bright fresh Steelhead and 50% older – darker Steelhead. These newly arrived fresh Steelhead fought like a Nov. Steelhead, with speeding bullet runs, numerous somersaults, tail walks across the Salmon River pool and traveling 10 feet thru the air before splash down. AMAZING! While the older Steelhead gave us the normal sluggish cold water temp. fight. Salmon River fishing report Tip’s. -Current Salmon River high water is bringing in even more fresh Steelhead – AS I TYPE THIS! Once this higher water flow drops to a more wade angler “friendly” level. I’d highly suggest coming up! Here is the NEW Salmon River Water level link to help you keep track. You will not only have older steelhead that have been entering since Oct. But also that last big push, plus the ones that are running the Salmon River now. More Salmon River Fishing Report Steelhead Tip’s. – The Pools are fishing best along with their soft water seams. With some transitional (running the river) Steelhead holding in their middle of the day resting spots between 9:30am. and 6pm. Don’t forget about the pockets in the rapids where some transitional steelhead will hold for a short amount of time. These pockets are over looked by the average Salmon River Steelhead angler that simply walks by them! – hint. Salmon River Steelhead Opportunity’s Abound! – With the past Rain, above freezing temps. and Snow Run-off, causing higher water flows. Optional Local Creeks and Streams are with fresh runs of Steelhead. Thanks for viewing my Salmon River Fishing Report! Salmon River fishing report, Salmon River guide Steelhead fishing report. Dec. 8, 2018 – Highlights. I’m happy to report. – Fresh Steelhead continue to enter and run the Salmon River daily. 80% Older and 20% fresher Steelhead Top to Bottom of the Salmon River. Always a chance for a Trophy Brown Trout. The Pools are fishing best along with their soft water seams. Water Temps. are in the mid. 30’s, making it easier to land your Steelhead. The average size of our Steelhead are up this year. With the past Rain, above freezing temps. and Snow Run-off, causing higher water flows. Optional Local Creeks and Streams are with fresh runs of Steelhead. Today’s Salmon River Fishing Report guide Tip. – Noticing 1/2 to 3/4 less drift boat guide and Steelhead anglers fishing mid-week. Offering you greater Salmon River Steelhead fishing opportunities. Plenty of prime Steelhead spots open to fish that are holding your Chrome! As Usual – Steelhead fishing has been sloow, so-so, ok to good. With a few anglers hitting it just right with AMAZING results! The Best Salmon River Steelhead fishing has happened when you find a pod of’m. Another Salmon River fishing report Tip. – Suggest covering your water thoroughly in the better spots and then move to the next. That’s what this Salmon River guide has been doing, with success. Never know, that next BIG pod of Steelhead might just be around the next bend of the Salmon River, where memories are made. Thanks for stopping by, Salmon River fishing report Guide Randy Jones. 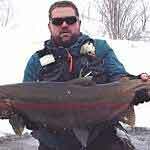 Salmon River Fishing Report for Steelhead fishing Pulaski NY. Nov. 23, 2018 – Highlights. 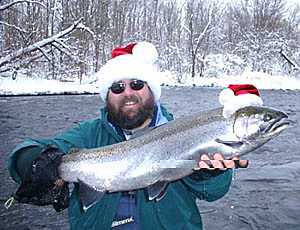 Higher Water flow levels continue to bring in MORE Steelhead into the Salmon River for your December Steelhead fishing pleasures in Pulaski NY! I’m normally finding ok, good to REEEEEEL Good #’s of Steelhead in all the normal places for this Water temp., Water flow level and Current Breaks. Today’s Salmon River Fishing Report Tip. -The Salmon River Water Temp. is approx. 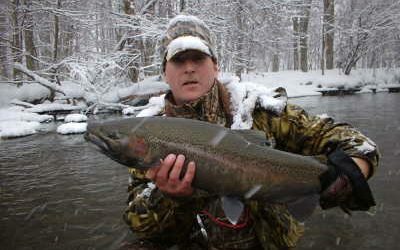 38 degrees so your Prime Winter Holding Steelhead Habitats are producing Best! 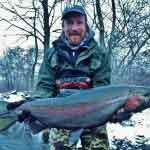 Best Steelhead fish’s, Salmon River fishing report Guide Randy Jones. In my last 5 Salmon River Fishing Report Steelhead Guided Drift Boat Spin/Fly fishing trips. I had 1 Slow day of 3 Steelhead hooked up with a Magnificent – Galvanic – Flying thru the air for 20 feet, before splash down – Silver Bullet Runs – Tail walking – Somersaulting Chromer landed off the guide drift boat. We had 4 day’s of fighting between 9 and 14 Salmon River Steelhead daily! – Ya-HOO! With 1 to 2 anglers on the guide drift boat using Spinning rods, Fly Rods or Floats. Using beads, egg sacks and aquatic insect fly imitations all dead drifted to match the middle to bottom current speed. So it would look natural to the Salmon River steelhead. Combined with perfect presentations, matching the hatch of eggs or aquatic insects and rigging according to the education level of the Steelhead. More Salmon River fishing report Tip’s. – All the above guided drift boat spin/fly fishing Steelhead came from different Exact as fitting a key into a Lock Spots. Using Daily Water Temperature, Daily Water Flow levels while Combining these to decipher what Salmon River Current Breaks the steelhead would be 100% using for each individual day. Best Steelhead fish’s, Salmon River Drift Boat Guide Randy Jones. Salmon River Fishing Report. 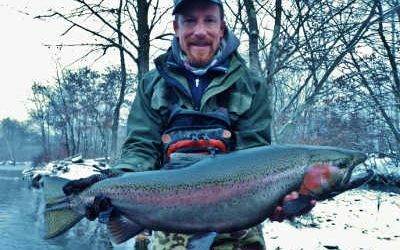 Guide Steelhead fishing report Pulaski NY. Nov. 4, 2018 – Highlights. We have Steelhead Top to Bottom of the Salmon River in Pulaski NY. As everyday pass’s, we are seeing more steelhead enter and run the Salmon River. Current Higher Water flows – Plus Run-Off, continues to bring in fresh Steelhead into the Salmon River for your fishing enjoyment. Offering You Opportunity with a possible – probable presence of Steelhead. Ye-Haa! Today’s Salmon River Fishing Report Tip. -The Salmon River Water Temp. is approx. 45 degrees, so your Prime Fall Holding Steelhead Habitats are producing best! We’ve got more 9-13 lb Steelhead in the Salmon River since 2010. This year so far, the average weight of your Salmon River Steelhead has been 11.5 lbs. Seeing numerous jumps, tail walks and speeding bullet runs from our Steelhead of late! Last Guide trip was incredible with 11 Steelhead on with 1 guest using a spinning rod. All the Steelhead came from a – Exact as fitting a Key into a Lock spot. Magical! After my guest’s 3rd Steelhead, he said this was the most Steelhead he had ever played with in a day. More Steelhead than his last 3 trips combined! I guess we didn’t need the extra 8? har-har. I always enjoy being a part of a record setting day for my guest’s. 2nd Salmon River Fishing Report Tip. -Most of the Steelhead I’m finding are the ones that are Transitioning up the Salmon River and holding in their middle of the day resting spots. (Between approx. 9:30am. and 5:30pm.). Or in their Prime Fall holding Habitat, where the Steelhead will sit for an extended period of time on the Salmon River. More Salmon River Fishing Report Tips. Some Steelhead are in Transition as they steadily run the Salmon River. – YouTube Video. Some Steelhead holding in there middle of the day resting spots Video. Advanced Steelhead and Brown Trout Locations on the Salmon River Video. #1 place to target in the Water Column for Fall Steelhead. – YouTube Video. Today, I fought and landed 20 Steelhead in 1 hour fishing time, all WORLD RECORD sized 30 lb’rs! Then I woke up from my dream. Late to bed, early to rise, fish all day, make up lies………..
You Lie about the size of your fish and I’ll swear to it! May all your door knobs smell off big fish, Salmon River fishing report guide Randy Jones. Salmon River Fishing Report for Steelhead fishing w/ Pulaski NY guide. Oct. 21, 2018 – Highlights. Better Steelhead and Brown Trout #’s around on the Salmon River in Pulaski NY. King and Coho Salmon fishing winding down. The Start of Steelhead season is looking good!! We are seeing more Steelhead daily on the Salmon River, with many more to come! Salmon River fishing report Guide Tip. – With decent #’s of Steelhead entering, running and spreading out on the Salmon River for late Oct. You might try coming up now thru the end of Oct. before the Nov. Steelhead crowds arrive. As I floated the Salmon River in the guide drift boat, many Steelhead spots were WIDE OPEN! (mid-week). While other larger Steelhead spots, only had 1-2 anglers fishing for Steelhead. For the last month, Steelhead have been entering the Salmon River to eat ALL the King and Coho Salmon eggs. More Salmon River fishing report Tip’s. – These #’s of Steelhead will increase in Nov. (along with more anglers). November is also when the Brown Trout will spawn. Dropping their eggs that the Steelhead will also target. In December, we will see even more steelhead. The Bonus of Steelhead fishing in December is you will see less angler’s and drift boat guides fishing due to colder temp’s. and the upcoming Holiday’s. Offering you greater Steelhead fishing opportunities on the Salmon River. The rest of the Steelhead will enter when there biological clock tells them too. Or, when we have a higher water release from the Salmon River dam or Natural run-off. Presently, If you can hook 1 or 2 Steelhead in a day you did good. 3-4 in a day, you did great! Some Steelhead anglers are doing bigger #’s. Things are looking Good, for your upcoming Steelhead and Brown Trout fishing adventures on the Salmon River. 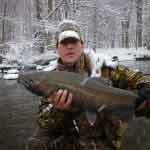 Salmon River fishing report for Steelhead, King Coho Salmon fishing with this Pulaski NY Guide. Oct. 15, 2018 – Highlights. Most King and Coho Salmon are in the Holes or Spawning. 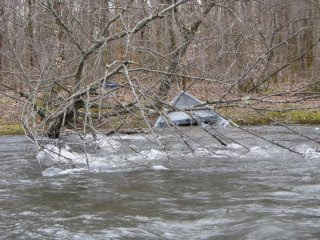 Increased #’s of Steelhead and Brown Trout running and holding in the Salmon River, Pulaski NY. Today’s Salmon River Fishing Report Tip. – We continue to see some fresh King and Coho Salmon entering and running the Salmon River. A few in Transition. A few holding in the mid. day resting spots. Some in the pools. Some on that special rock. Some dead from spawning – P-U! It’s a fun time of year, walk anywhere along the Salmon River and the odds are good you’ll hit some. In 30 years, this fishing report Guide has never seen so many spawning beds or more Salmon per bed. Im seeing numerous beds in area’s I’ve never seen them before. Any lil patch of gravel has them. One secluded area had 6 beds with 50 Salmon over a 200 foot area where I’ve never seen them before. Instead of the usual 2-5 Salmon per bed. I’m seeing a lot of 6 to 12 Salmon per bed. Throw some Steelhead and Brown Trout in the mix and all is SWELL! Latest fishing report on your Steelhead and Brown Trout! Salmon River Fishing Report Tip’s. – Nice Push of Steelhead just entered the Salmon River. With many more to come, now thru Spring. Noticing MORE Steelhead thru out the Salmon River, top to bottom, eating eggs. Your Steelhead season is starting right on schedule! We currently have some Steelhead and Brown trout in Transition (Running the Salmon River). Some holding in the mid. day resting spots. Some are Holding in their Prime Fall Habitats. And some sitting behind the Spawning Salmon eating their eggs. Best fish’s, Salmon River fishing report Guide Randy Jones. Salmon River Fishing Report for Steelhead and Salmon – Sept. through April. Page 2 – Salmon River Fishing Report Humor, Tips and Article for the Salmon River, Pulaski NY. 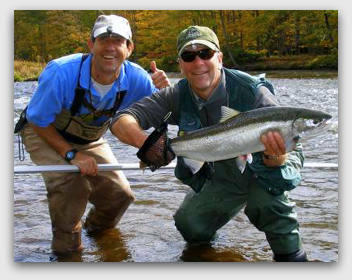 Thumbs up from this Salmon River fishing report guide with a Very Happy Steelhead Guest.